Take a Minute, Save a Life. News.com.au is proud to have contributed to at least 4 per cent of the new 21,220 registrations last year. At least 870 registrations were completed through a specific link included in news.com.au stories and these numbers don't include registrations completed by those who went directly to the site later. 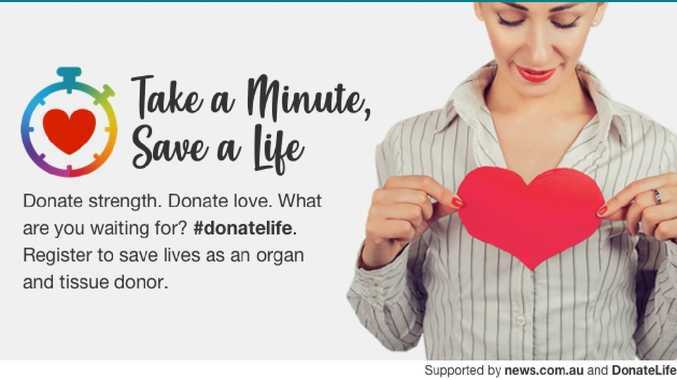 Overall there were more than 8600 click-throughs to the DonateLife page through news.com.au articles between July 29 and November 12. "We salute from the bottom of our hearts the 554 selfless and generous Australians who have given the gift of life in the past year, especially their families, who play a crucial role by confirming their loved one wanted to be a donor," Mr Wyatt said. "This means that in the 10 years since the national program started, organ donation has more than doubled, saving almost twice the number of people through transplantation." "One of the key factors driving the increase in donations is a significant rise in the consent rate, from 59 per cent in 2017 to 64 per cent in 2018, the highest rate ever recorded," Mr Wyatt said. This is why it's important for donors to both register and tell their families about their decision. "Increasing our consent rate to 70 per cent would place Australia in the world's top 10 performing countries and we are now within 6 per cent of achieving this goal," Mr Wyatt said. "Clearly there has been significant progress but there is more we can and must do to increase donation. "With around 1400 Australians currently waitlisted for a transplant, and around 12,000 people on kidney dialysis, it is crucial that everyone thinks about donation, talks to their families and registers on the Australian Organ Donor Register."